Forward thinking executives strive to focus the right resources, on the right areas, at exactly the right time, to yield the most effective and efficient outcome. While this goal may present challenges for your internal control or compliance program, the good news is that the same problem has been addressed in other disciplines. Manufacturers have been using the powerful framework called “lean production” for decades to improve product quality while decreasing costs. Applying analogous “lean principles” to your program can deliver improved performance at decreased cost. 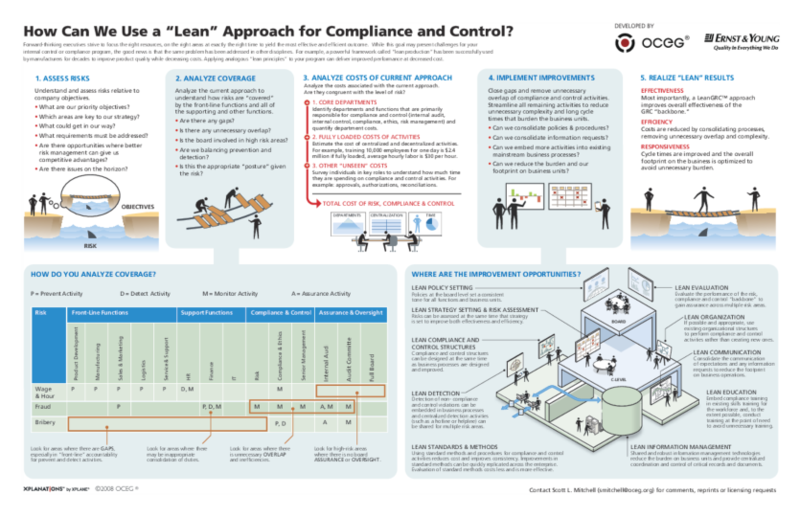 We have emailed instructions to access Illustration – How Can We Use A Lean Approach To Compliance And Controls to . Make sure the email arrives in your inbox: either add "support@oceg.org" as a safe sender to your email platform, or if you use Gmail, drag our email into your Primary tab.